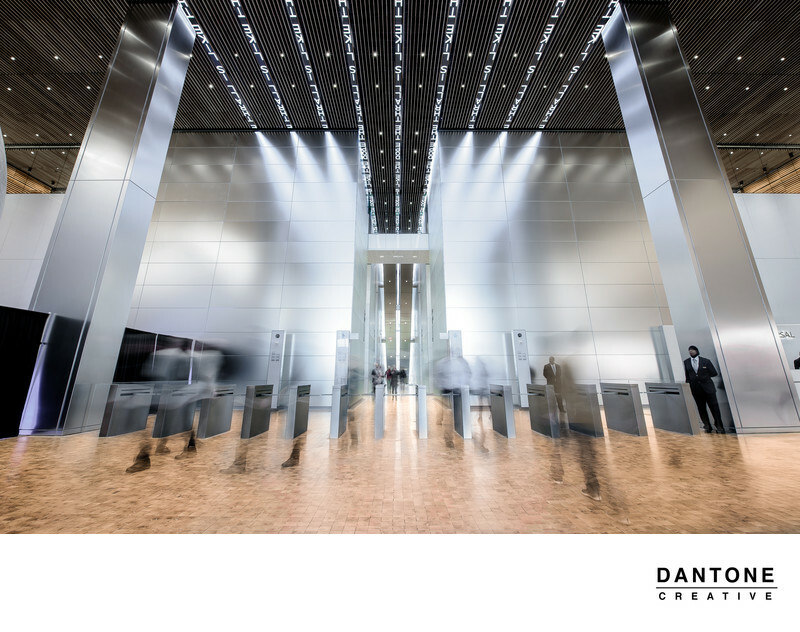 Dantone Creative was hired to photograph a new and exciting meeting space in the new Comcast Technology Center located on 1800 Arch St. in Philadelphia. We were hired to create a digital roadmap from the Lobby of the new comcast building up to the newest most technologically advanced meeting spaces around. Comcast Technology Center has some incredible features from the lobby up to the EBC level of the building. Once you arrive in the sleek lobby, you'll notice love poems being streamed across the digital ceiling. Walking through the modern turnstiles, you are funneled into the brushed aluminum elevator corridor. These elevators do not have buttons, as it will know exactly where you need to go. They have a digital screen of the current location of the elevator in the building so you know exactly where you are and what floor you are approaching. Arriving at the business center level in the new Comcast Technology Center is pretty much every techies dream. Mirrors turn into TV's, shades are drawn across windows depending on time of day and the temperate average of inside/outside to control interior temp. The main lobby morphs into different set up depending on the client being brought into the space. This floor was built for executives to come in and explore the new and amazing features of the new Comcast/Xfinity products that are hitting the market. Location: 1800 Arch St, Philadelphia, PA 19103.